DO YOU THINK JJ ABRAMS WILL DESTROY STAR WARS TOO? Darth Vader already blew up Alderaan, so JJ Abrams will not be able to blow up Vulcan in the upcoming Star Wars films. At least, I hope not. If he destroys Kashyyyk, there will be a lot of angry Wookies after him, and I’m telling you, Wookies hold a grudge much longer and harder than the pacifist Vulcans. I was not a big fan of the JJ Abram’s Star Trek reboot. Yeah, the 2009 film was fun, but it made so many radical changes to the accepted story lines that it felt more like Abram’s was playing with the action figures of Kirk and Spock that Roddenberry left on the living room floor. Don’t even get me started on Star Trek Into Darkness. Ugh……. What I’m thinking about, though, is what will Abrams do to Star Wars. It seems there are three options. 1. 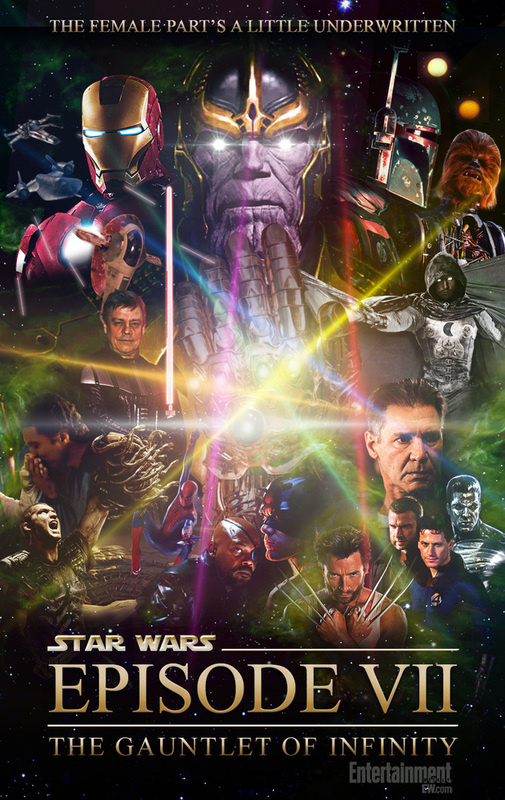 A complete reboot, like the Star Trek film, and find someway to recreate Luke, Leia, Vader, Han etc… I don’t think he will do this because that is exactly what he did with Star Trek. But if he does . . . will Obi Wan Kenobi still be a liar? 2 Play with the characters–but totally ignore all the written literature and just set it 30 years after Return of the Jedi with a fresh new script. If you do this, Abrams, you will really make a lot of fans angry. Starting with me. 3. Use the written literature’s characters and their personalities to launch into something really new and dramatic, but that doesn’t undo everything we already love about the Star Wars Universe. My personal preference is to dwell on the Solo children: Jacen, Jaina, and Anakin. I’ve already begun to cast it, actually. Jaina must be played by Jennifer Lawrence. She could so easily channel the dark side like we all know Jaina has going on. But for the love of all that is good and decent, please keep Shia Labeouf away from this film project. But wouldn’t Famke Janssen make a great Mara Jade? I mean, its only natural for Janseen to be in Star Wars, she’s already got James Bond, X-Men, and Star Trek (TNG) under her belt. As you can tell from this fake poster from Entertainment Weekly, I’m not the only one thinking about it. If they go with with the Solo children, then the big question is–when? When do they pick up the story. A natural thought is the Yuuzhan Vong invasion chronicled in the excellent New Jedi Order series. The problem with that, though, is the story is already written. We know how it ends. RIP Anakin and Chewie. So, my suspicion is that they will go the Solo Children route, but the prologue to start will be “Rebuilding after the devastation of the New Republic, The Skywalker and Solo families face a great challenge from within their own family …” and then we learn about the new trouble that has arisen as Jaina does what we know she wants to do–become Sith. I think that story has juice because the Republic is broken so it has the elements of dystopia we all loved in the original Star Wars but the younger set to work with. They are trying to rebuild something they never experienced, because they became adults in a time of war much like Luke, who grew up in an oppressed society but fought for freedom. It also carries that old “sins of the father” motif we know Lucas loves dearly. Yeah. Abrams, I’m waiting for that phone call when you invite me to come help you write that script because I really want to keep from from repeating that dreadful Khan debacle from this summer. Call me. Once again, evidence that the fans have a better sense of these epics (SW and ST) than the folks charged with their continuation on screen. And, yes, my confidence in Abrams is just as low as yours…..
thanks for reading doug. i think you are right–most fans i know instinctively know where something should head and what would be just terrible. i think the studio types get so wrapped up in their own “genius” they forget to think about us. yeah, wannnabesaint, i feel your dilemma. the prequels were disappointing. on second thought, abrams is free to blow up the planet of naboo so long as we know jar jar and all his offspring are on it. thanks for reading, and we will hope together for our worse fears to not be confirmed. I’ll admit that I’m no devotee of the Star Wars universe–sure, the movies were a big thing when I was a boy, and I had action figures and whatnot, but I have not seen or read anything other than the movies, and I only really like two of them–but if these new films don’t start with Boba Fett escaping from that Sarlacc (I had to google that: I told you I’m no expert in these things) and going on to an illustrious second half of his bounty hunting career, somebody should put a bounty out on J.J. Abrams. Somebody should have put that same bounty out on George Lucas thirty years ago, by the way. I am better versed in classic Star Trek, and I did not like Mr. Abrams’s reboot of that. Nope, not one bit. (Well, OK, that Simon Pegg chap was clever as Scotty, but that’s the only good thing I have to say.) I didn’t see his second one. the casting for the 2009 star trek reboot was great–pegg was outstanding and so was the guy who played mccoy. the problem for me was just screwing around with the timeline. by the time abrams was done, nothing of classic kirk was left, tng was gone, DS9 which i loved is non-existent, and so is voyager. all that’s left, for crying out loud, is the worst series of all: enterprise! you should watch into darkness, especially if your well trained in the classic star trek but it is far less than it could have been. abrams doesn’t understand the difference between homage and copycat. I am not far into either Star Trek or Star Wars. Or Battlestar Gallactica. I have long felt that Star Wars stands or falls with Harrison Ford/Han Solo and Chewbaca. And I found Captain Kirk the least appealing part of Star Trek, but the new re-invented one is not better. My science fiction fandom has all been directed at series that were cancelled before their time, like Flash Forward. I realize I am sort of out in left field here. But Galaxy Quest was one of my all time favorites. Does that seal my fate or redeem me a little? it redeems you, definitely redeems you. galaxy quest is one of our family favorites. the ability to no take itself so seriously is what makes sci-fi so great. and therein lies part of the problem of jj abrams newer star trek’s, they take themselves far too seriously. meanwhile, never give up. never surrender.